As the economy bounces back in 2011, there are a number of indications that hiring will increase among growing companies, especially when it comes to contract work and freelance opportunities. We have seen a rise in social media positions by over 50 percent in the last six months, and this number is continuing to climb. Urban Interns (http://www.urbaninterns.com), an online marketplace that connects growing companies with individuals seeking part time jobs, internships and freelance positions, is experiencing growth in freelance and part-time employment. In 2010, 86% of positions posted on Urban Interns.com were for less than 20 hours a week of work, supporting the trend of a shift towards freelance and part-time employment. Furthermore, 82% of those jobs were designated as “virtual”, which is due to an overwhelmingly large demand in the digital media space. Employers are increasingly seeking candidates with an understanding of how to utilize new technologies, particularly for tasks such as online marketing and public relations. Employers can browse the Urban Interns database to find an intern or freelancer, or register their company to post job opportunities. 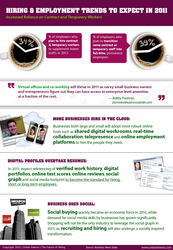 Co-working environments and virtual offices will thrive in 2011 as tech-savvy entrepreneurs and business owners recognize that they can have access to enterprise level tools at a fraction of the cost. Improved online collaboration tools such as shared digital workrooms, video conferencing, and cloud-based project management software, are one of the many reasons why hiring virtual interns, freelancers and part-time employees makes sense for businesses of just about any size. In 2010, demand for social media skills topped our charts. In 2011, you can expect to see this trend continue. Urban Interns is a national marketplace that connects growing companies with people seeking part time jobs, internships and freelance positions. Urban Interns was named one of America’s Most Promising Startups by BusinessWeek.com and has been featured in Tech Crunch, the Wall Street Journal, Crain’s NY, Fox Business News, and Reuters.